Remember when we were kids. 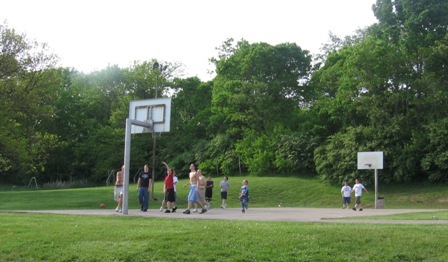 All you had to do was go down to the park and there would be kids playing baseball, basketball, football. No one ever played soccer where I grew up. Well, this week, I went down to the park. Low and behold a pickup game! Sure there was massive organized baseball being played, but right there in the middle of the MSA season, was a pickup game. A completely spontaneous, non-officiated, spur of the moment, pickup game! To the kids in this photo, thanks guys. You give me hope that everything will be ok in the future.